New leather look in our patented collapsible gift and storage boxes. 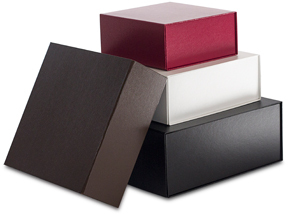 6 x 6 x 2-3/4"
These unique patented rigid boxes are ideal for high end retail items. Choose from Scarlett Red, White, Black and Brown. Each box is wrapped in a semi matte textured paper inside and outside. Make from very heavy rigid cardboard to hold just about any weight. Magnets keep the box closed.